A powerful jetstream, blowing at up to 275mph across the Atlantic, is continuing to drag a train of storms to the UK through next week, though Christmas Day itself looks like a relatively quiet cool respite for us in Reigate. Inland across the SE is usually sheltered from deep low pressure systems that track across the NW of Scotland: so far we have escaped the worst of these storms. This week, there are 3 major storms that are due to arrive over the UK bringing gales and heavy rain to many parts. 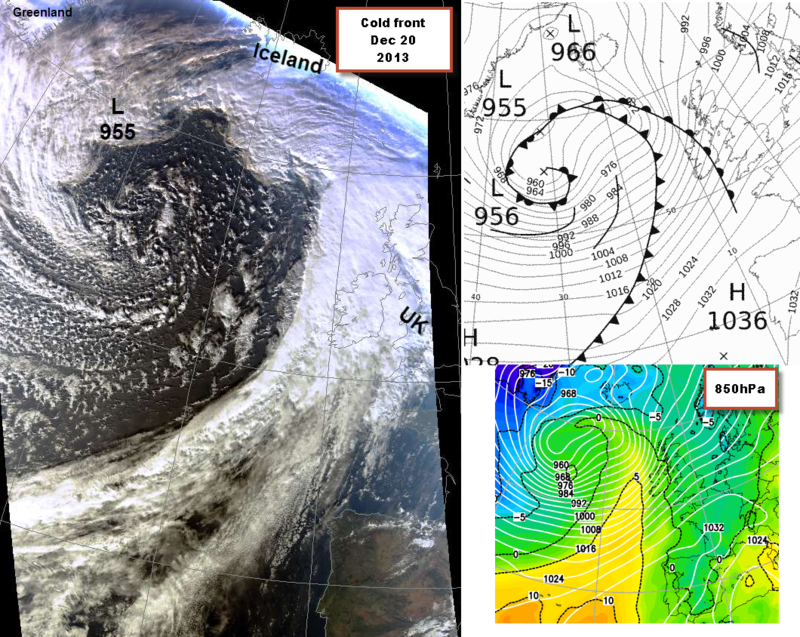 Each storm brings progressively cool airmasses to the UK from an increasingly more polar origin. 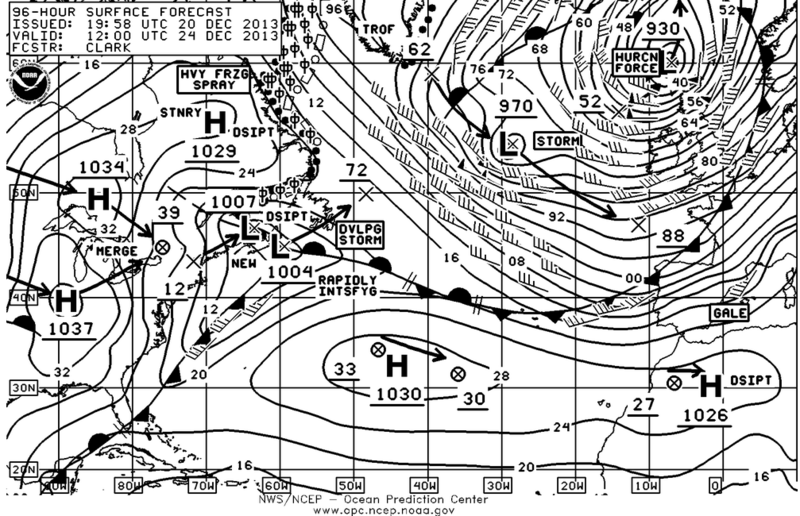 So, let’s call these storms The Three Kings: Melchior, Caspar and Balthazar, the biggest of these is likely to be Caspar shown below in stark detail on the recent NOAA Atlantic forecast run. See if you can spot the UK under that mass of isobars and wind feathers (each feather = 10 knots). First off, Melchior brings gold: heavy rain! Melchior has already arrived and is set to bring a windy and wet Saturday to the SE. The notable feature of this storm is shown below as a fast moving cold front and remarkable clearance as polar maritime air sweeps in with showers. Note how the wind direction is essentially from the Atlantic source, running over warm-ish sea surfaces to arrive here, hence our mild-ish temperatures. 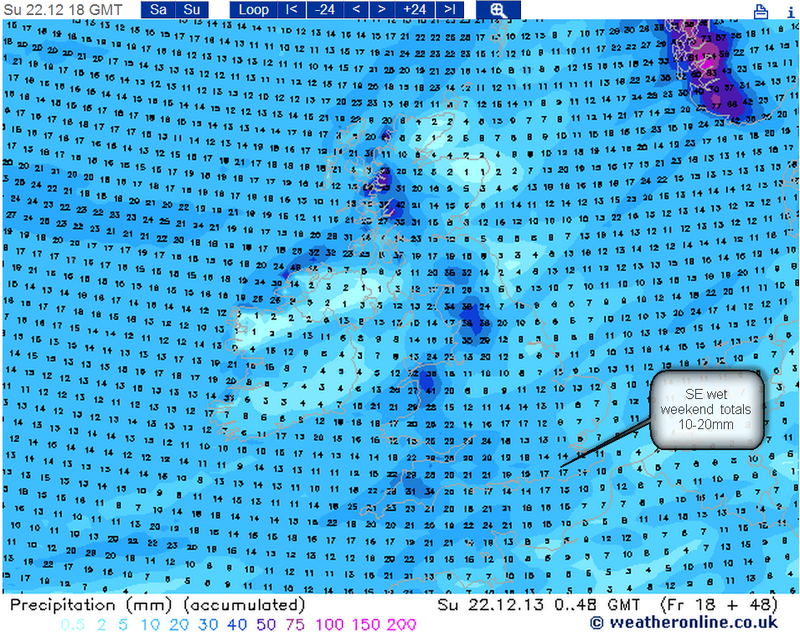 For the SE it is likely to be most windy around Saturday lunchtime, with gusts around 30-40mph and lots of rain adding up to 10-20mm during the course of the weekend. Local flooding possible. 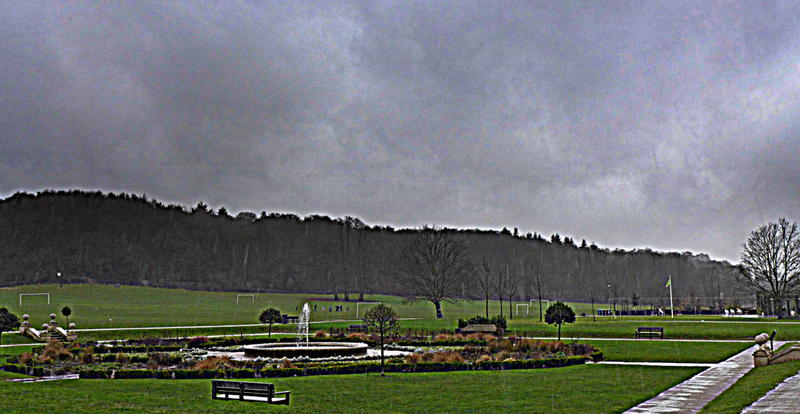 Reigate Priory Park 21 Dec around midday: wet! Next up, Caspar: bearer of high winds and heavy rain! On Monday-Tuesday a LOW is set to rapidly intensify on the left-exit region of the jetstream. A remarkably low central pressure of 928mb is forecast on current GFS and ECM runs, while the UKMO brings it down to 940mb (still v low). This storm exhibits all the hallmarks of rapid cyclogenesis and a “bomb” style depression: pressure falling very quickly (20mb in 3 hours) producing exceptionally high winds: knowing where these winds will occur is the tricky bit! Caspar is set to track close to NW Scotland, with a jetstreak feature bringing unusually powerful winds across the SE on Monday night: so we may not escape the worst of this storm. Model runs are currently bringing 70mph+ gusts to some parts of the SE. So wind speeds could be higher than StJude for some locations: remember StJude was tightly located along the South Coast, Casper is a much bigger storm potentially covering the entire country in stormy weather at times. These extreme wind forecasts may moderate (as the GFS usually does exaggerate things!) nearer the time but it is best to assume that Monday and Tuesday will be inclement weather for Reigate, the SE and the whole country: all models agree on this. At 928mb, Caspar may not quite be a record breaker for low pressure but it is still a storm to watch, with a central pressure equivalent to a Cat4 hurricane! (In 1884 a storm reputedly had a central pressure of 925.6mb, the lowest central pressure measured OVERLAND in UK; see below and strongest modern storm since 1993 Jan storm 914mb) Caspar unlikely to beat either of these records. Caspar could bring snow to the north of the UK, especially to high ground. Balthazar: the mysterious one as yet: after a quieter Christmas Day another storm is looking likely to emerge later next week that could drag down somewhat cooler air from the Poles. This is way-off so details are sketchy but a gradual cooling with more direct influence of polar air might be a feature of late December. Throughout next week enjoy the festive period but if you are travelling it will be wise to check the UKMO forecast.